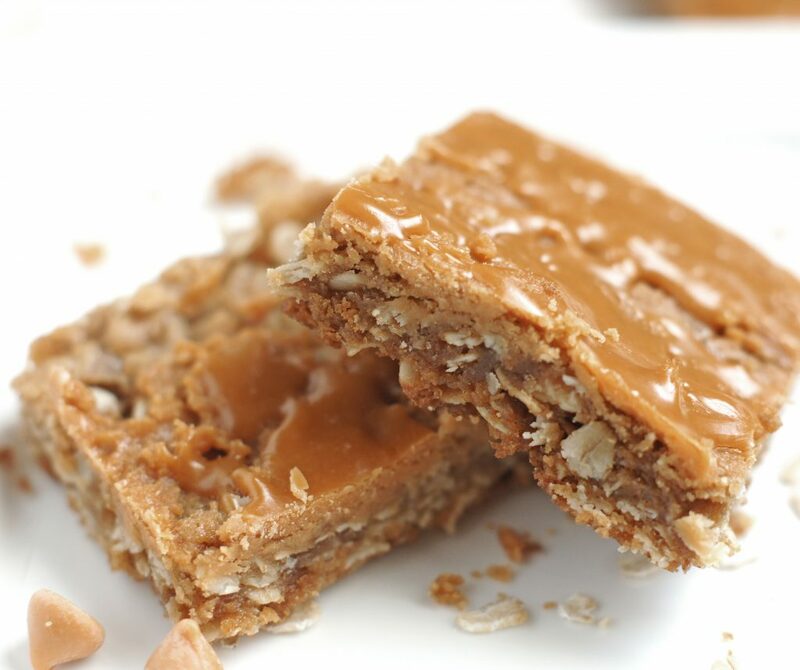 Melted butterscotch chips, browned butter, dark brown sugar and oatmeal make these bars absolutely irresistable. These Oatmeal Butterscotch Bars are a bar version of a childhood favorite cookie. Raise your hand if you loved oatmeal scotchies as a kid. I certainly did, they are one of my childhood favorites. I loved them as a kid and still love them today even though there isn’t an ounce of chocolate in them. I happen to love butterscotch chips in cookies. These bars are amazing and I bet you can’t eat just one. The combination of the browned butter (which just takes these to a whole other level), the dark brown sugar and melted butterscotch chips makes for an incredibly scrumptious bar cookie! You can certainly use light brown sugar if you don’t have any dark on hand. I’ve made these both ways and while the difference in flavor isn’t huge, I do prefer the dark brown sugar. It creates even more depth of flavor. The trick here is to not overbake these bars. Trust me on this! The magic number for my oven is 15 mins, but ovens vary so watch them closely. They will still look slightly underbaked, but take them out. The edges will just barely, barely begin to be golden. 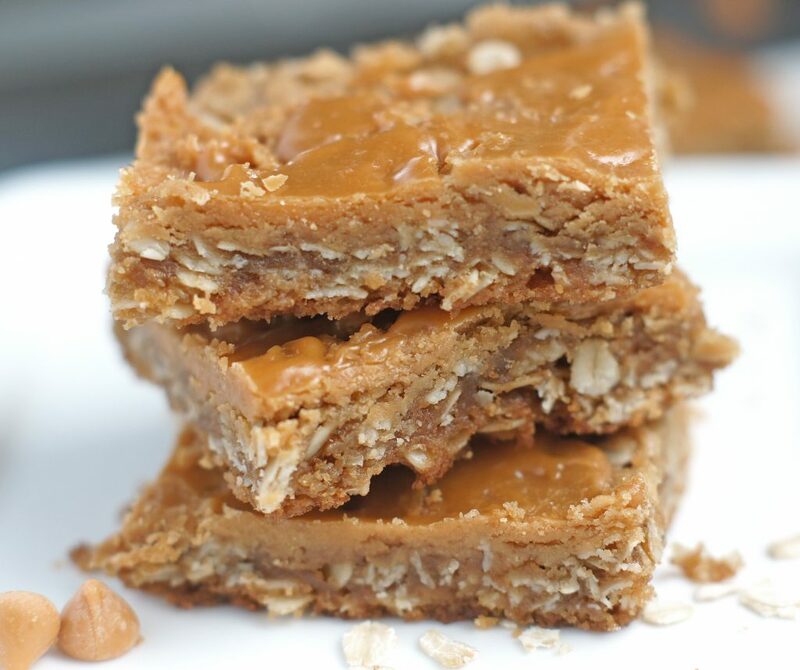 If you’re a fan of oatmeal scotchies then you will be crazy in love with these. Preheat the oven to 350 degrees. Line a 9X13-inch baking pan with aluminum foil. Lightly grease the foil with cooking spray. Whisk together the flour, oats, baking soda, and salt and then set aside. Place the 3/4 cup butterscotch chips in a large bowl. Pour the hot melted butter over the butterscotch chips and whisk together until the chips are melted and smooth. Add the brown sugar and whisk until combined. Add in the egg and vanilla. Whisk until smooth. Stir in the flour mixture, just until incorporated. Scrape the batter into the prepared pan and spread the batter evenly to the edges. Bake the bars until a toothpick inserted into the center comes out with just a few moist crumbs, about 15-17 minutes. Don't overbake!! After the bars come out of the oven, make the drizzle by placing the butterscotch chips, brown sugar, water and salt in a small microwave-safe bowl. Cook for 1 minute at 50% power, stir until smooth, and cook in 30 second increments if still not melted smooth. Slowly drizzle the glaze over the warm bars and gently spread. Let the bars cool completely in the pan. 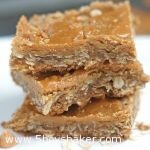 If you want a chewy bar, use old fashioned oats, which is what I did.